Android Studio 0.2.0 update … encountering issues with both new AND existing projects. I’m fortunate that using the latest and (sometimes not so) greatest is actually my job. With that I’ve been able to heavily use Android Studio ever since it was first released. To my knowledge, I’ve installed and heavily used every public update since the release. Everyone of those updates went pretty smooth … until this one. I can’t build existing projects. The good news is that resolving these issues was pretty easy. This issue appears to be specific to folks using Android Studio on Windows. Basically, the message indicates that Android Studio can’t find a dependency. The solution turned out to be that a fresh install is requried …. This turned out to be a two-fold problem for me. The first issue has to do with a fairly well documented change that’s been made to Android Studio. They’ve changed to a new version of Gradle that’s not backward compatible. As a result an attempt to build a project that was created with a prior version of Android Studio shows the following error. The fix is to change the version of Gradle that’s referenced in your project’s build.gradle file (located in top-level of project folder). If you click on the “Search in build.gradle files” link in the above dialog it’ll open the build.gradle file for you. Or you can just open the build.gradle file yourself. It’s quite small and easy to navigate. This will cause Android Studio to use the required version of Gradle. The problem is related to extraneous entries that were added to the [ProjectName].iml file (in your project’s top-level folder) by earlier versions of Android Studio. To fix the problem, exit Android Studio and open the [ProjectName].iml file in an editor and delete the entire component element with the name “FacetManager”. And with that … SUCCESS!! … I’m now able to build the project without difficulty. 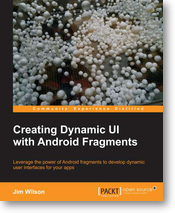 To Learn more about Android programming, checkout Jim’s courses at Pluralsight. 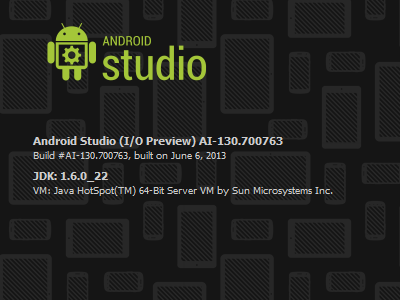 The latest update to Android Studio, version 0.20 is now available. The list of updates and changes in this version can be found here. If you’ve been working with the last few builds of Android Studio you know that the ability to create new resource directories was broken. The only work-around was a hacky process of going into some of the settings dialogs and creating the folder from there. Well the 0.1.9 patch just came out and the New Resource Directory dialog is back (actually it came back in the short-lived 0.1.7 release from a few days ago). I love the way that this is implemented because it takes care of all of that subtle folder naming that goes into resource specialization. Android’s support for resource specialization is one of the real powers of the platform in my opinion but manually building those names can be easy to mess up. With this dialog you simply select the resource type, the qualifiers and then enter or select (depending on the qualifier) the value to qualify by. This is a great feature and goes a long way to making one’s life simpler. This is part 2 of my series focused on helping developers move from the more traditional development space of Web-based or desktop apps to the world of Mobile on Android. The series is written from the perspective of a developer coming from a .NET background but is really for anyone with programming experience wanting to learn to program on Android. Many years ago when I first started teaching and writing training materials, my work was focused on students who were new to programming but for the last decade or so, I’ve been much more focused on advanced and intermediate-to-advanced topics. I had forgotten the joy of breaking concepts down so that they are easily understood by someone new to the environment. Getting to do that again, makes this series is great fun to write. I feel everything came together on this course and I’m really proud of it. I hope you enjoy it. Part 3 should be available in about a month. BTW: If you missed the first course in the series, I encourage you to check it out as well. Android for .NET Developers: Getting Started. As you’ll recall, I posted yesterday about working around the issue in Android Studio where copying a project to a new folder creates problems because the Android Studio project keeps references to the original folder. After my post yesterday, I figured out an easier way to work around the problem. You still have to modify just as many files but the steps are easier to follow and perform than my suggestion from yesterday. We’ll use the same assumptions as yesterday. The cool thing about this workaround is that after copying the project to the folder, you always make the same (relatively simple) changes. There’s nothing specific about the destination folder in the changes we make. Note: I’m including line numbers just as estimates. Your line numbers will almost definitely be different. Be sure that Android Studio is completely closed. 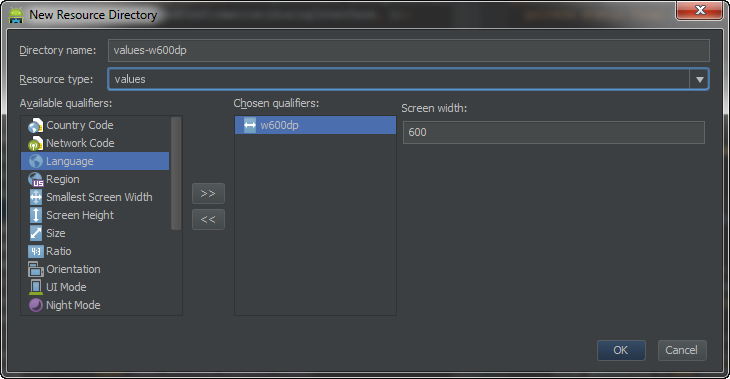 And with that, you’re ready to open the destination project in Android Studio. When you save the project, Android Studio will automatically save the new folder as the PROJECT_ABSOLUTE_PATH value. I’m finding these changes much easier to manage than the ones I walked through yesterday. But as I mentioned yesterday, the best news of all is that I suspect that this will be a short lived bug and we won’t have to deal with this workaround for long. For information on getting started developing Android applications or working with Android Studio, checkout Jim’s Android programming courses on Pluralsight including his latest course. Since I write training courses about Android development, I frequently have to copy projects from one folder to another. I commonly create a project in a “before” folder, copy the project to an “after” folder, and then do the work being discussed in the course in the project in the “after” folder. When students view the course they can download “before” and “after” copies of the project. Well one of the pains I’ve been dealing with in the preview release of Android Studio is the fact that when a project is copied from one folder to another, the project keeps pointers to the original folder. One ends up with a mess where some things in the new project point to the new folder and somethings point to the old. Deleting the original folder makes things even worse. I’ve reported the issue as an Android Studio bug. It appears to have been accepted as an issue but as of this writing the version of Android Studio currently available still has the problem. I’m certain this is an issue that will be addressed so if you’re reading this post substantially beyond the posting date, verify that the problem still exists before doing the steps I list here. UPDATE: The day after I made this post, I figured out a simpler work around. Please see this post for the new workaround. The solution I’ve found is to modify the path information contained in 4 of the project files in the destination folder. Before doing anything, be sure Android Studio is completely closed. Let’s make the following Assumptions in copying our project to a new folder. You may be prompted with a dialog indicating that it’s removing a non-existent project. Let it do that. It’s just cleaning up some internal data, it doesn’t appear to have any impact on the original project. Voila! We now have a copy of our project. The best news of all … I’m pretty sure that the bug that’s causing us to have to go through all of these steps (rather than simply copying the project folder) is a bug that will soon be fixed. Have you noticed a shortening of your laptop’s battery life when working with Android Studio? Android Studio is a great tool and some of the great things it does require fairly substantial processing to occur in the background. Much of this processing is constantly firing performing what are called Inspections. To get a sense of the kind of background work that’s going on, choose Project \ Settings from the Android Studio menu and then highlight Inspections in the Project Settings pane. To save power we could go through and turn off some of these inspections so that less background processing occurs. These inspections are good stuff, though. I prefer to have these checks available. Fortunately, Android Studio doesn’t require us to make this choice. Android Studio gives us the option of stopping the automatic checks and instead running them on demand. You can prevent these inspections from automatically running by selecting Project \ Power Save Mode in the Android Studio menu. 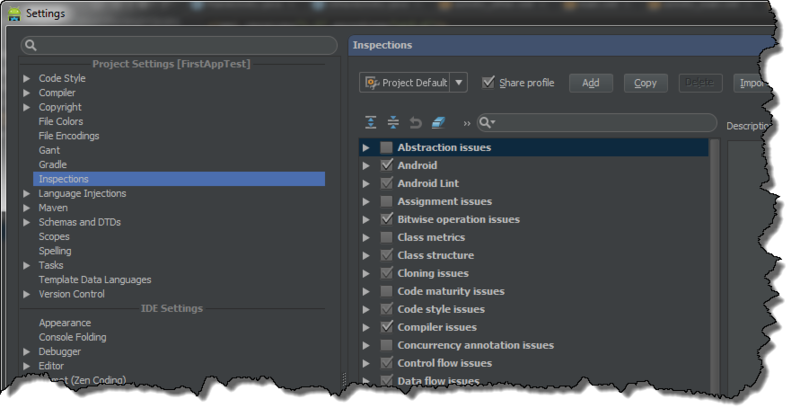 You can then run the checks manually by choosing Analyze \ Inspect Code… from the Android Studio menu. With this, we get the benefit of Android Studio code inspection while still maximizing our laptop battery life.